Let’s start with the National Restaurant Association. Every year they release a new list of the hottest trends in F&B, and this year’s edition was just released. Cannabis and CBD-infused foods were second on that list, only to be topped by cannabis and CBD-infused beverages. Yep, the marijuana industry is changing foodservice, and there’s a lot to learn in order to get up to speed. For starters, it’s important to know the differences between the two main types of cannabinoid ingredients we’re talking about, as these two are the predominant ones being used in food and beverage. Tetrahydrocannabinol, or THC, is the principal psychoactive cannabinoid that people associate with “getting high.” The higher the THC content of a particular strain of marijuana or associated edible, the more potent the result. The other cannabinoid most people have heard of is cannabidiol or CBD. CBD accounts for up to 40 percent of the cannabis plant’s extract and is associated with therapeutic properties such as anti-inflammation and relaxation without any of the psychoactive effects that come with THC. To boil it all down, our bodies have something called endocannabinoid systems that produce receptors called anandamide. Anandamide has been called the “bliss molecule” and comes from the Sanskrit root word for “bliss, joy, or happiness.” When we add THC, additional anandamide is added synthetically to our systems, while CBD tricks our bodies into thinking we’re not making enough, thus producing more. One of the primary ways to deliver THC or CBD is through ingestion. When oils or extracts are boiled down, they can be added to other ingredients to make brownies, gummies, pills, or more. These processes are having profound impacts on not just the foodservice industry, but the pastry ingredient industry as well. Chocolates, glucose, and other ingredients need to be processed in efficient equipment using easily regulated processes. All the major players are entering the cannabis market, as the giants like Coca-Cola and Pepsico explore ways to deliver CBD in a can. At the same time, there’s a craft cannabis beverage movement underway, as bars across the country explore CBD-focused cocktails. Either way, look for more and more CBD-infused drink, sodas, coffee, cocktails, or pretty much anything else you can imagine. Lastly, fine dining and pop-up dinners are a growing trend in the cannabis industry as chefs explore ways to use edible cannabis in different ways. We’ve come a long way from your stereotypical pot brownies, as the creative process today might include infusing an ingredient with marijuana smoke, vacuum-sealing that ingredient in a bag, and then cooking it sous vide style to infuse the flavors. Regardless of how your business aligns with the marijuana industry as it relates to food and beverage, you have to have the right type of equipment to execute your ideas. 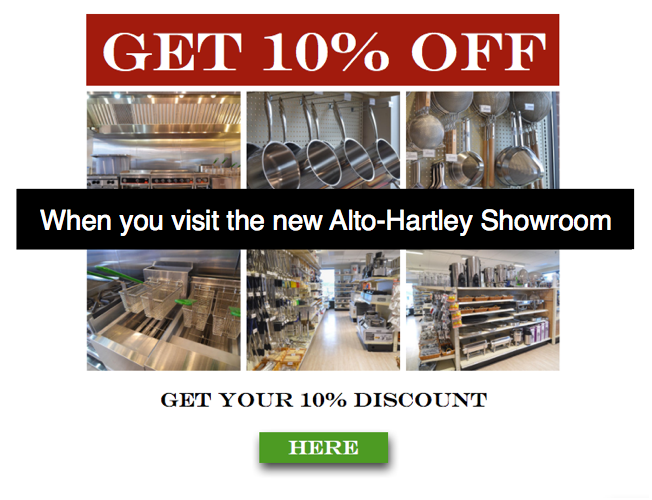 Come into our showroom to learn more about equipment that can help, and get 10% off your order in the process.